As home to over 130 institutions of higher education, finding the school best suited to you in Arizona may seem like a strenuous task. There are a multitude of important factors for prospective students to consider including program length, residency requirements, tuition cost and scholarship availability. Fortunately, we have applied our rigorous methodology to the latest education data to rank the best colleges in Arizona, including the top four-year and two-year schools. We started by pulling essential information from federal education databases. Our preferred metrics consist of quality indicators like program acceptance, enrollment, retention and graduation rates. Make your search for a college education easier by using our list of the best colleges in Arizona. Home to 50 accredited four-year schools, Arizona offers a wide array of conventional college choices. With 22 of the top 25 of Arizona's most in-demand jobs requiring a Bachelor's degree, there are clear economic incentives for pursuing an education. Employees with a four-year degree earn an average salary of $46,485, 86% more than workers with only a high school diploma. The Arizona Board of Regents hopes to substantially increase enrollment and graduation rates through measures aimed at obtaining additional state and federal funding. Their 2010 Strategic Realignment plan will ideally increase the numbers of educated citizens to fill skilled positions by 2020. Rising demand for highly educated workers combined with the irrefutable advantages of a college degree means now is an excellent time to attend a four-year college in Arizona. We have ranked Arizona's best colleges in the following list to guide your education decisions. Take a look and see which four-year schools made the list. Operating as the largest of the six campuses comprising the ASU system, the Tempe campus enrolled nearly 52,000 students during the Fall 2016 semester. Although the school only recently celebrated its 50th anniversary, ASU has been busy forging a name for itself. In 2017, the university ranked number one in the nation for Fulbright scholars, ahead of many other Ivy Leagues. Additionally, the school is currently working with NASA to lead its first space exploration mission. Amongst the ranks of professors, students may have the privilege of studying under a Nobel Prize recipient, a Pulitzer Prize Winner, or a recipient of the Macarthur Genius Grant. In terms of academics, ASU serves both undergraduate and graduate students at the Tempe Campus, with more than 100 baccalaureate degrees currently offered on campus and online. Programs of interest to students with unique aspirations include aerospace engineering with an emphasis in autonomous vehicle systems, digital culture, geographic information science, and urban planning. With five different schools offering degrees -- including the new College of Interdisciplinary Arts and Sciences -- the West campus of Arizona State is shaping up to be one of the best colleges in Arizona. Located in northwest Phoenix, students enjoy modern amenities combined with 21st century workforce preparation to create a highly valuable degree. With the second smallest enrollment of all the ASU campuses, students also benefit from having a tight knit community, allowing them to form meaningful mentorships with professors and lifelong friendships with their peers. Although the West campus is comparatively smaller than other ASU locations, it doesn’t stop the location from having a wide-spanning selection of undergraduate degrees -- 93 to be precise. Aside from all the programs students have come to expect from competitive universities, some of the innovative options available include international trade, exploratory social and behavioral sciences, American studies, and social and cultural analysis with a concentration in queer and sexuality studies. With a focus on education, engineering, interdisciplinary sciences, management, and technology, the Polytechnic arm of ASU is recognized as one of the best Arizona colleges for providing advanced laboratories and project-based teaching. Although the campus includes a regional airport, enrollment is kept to approximately 4,300 to provide an intimate learning environment. One of the aspects of campus that students continually praise is the desert arboretum, a quiet place for both contemplation and studying. With more than 100 degrees at the undergraduate level to choose from, students often select the Polytechnic campus both for its breadth of subjects and its focus on providing career-focused educations that prepare them to be competitive job applicants. A sampling of courses quickly highlights a number of programs that can’t be found on every campus, including air traffic management, global agribusiness, environmental and resource management, and history of science, ideas, and innovation. Founded over 50 years ago in Phoenix, SAGU American Indian College provides access for underserved communities, primarily Native American students. AIC offers more distance education programs than traditional campus-based degrees. While the school administers on-campus programs such as church leadership, elementary education, and business administration, distance degrees are available in areas such as criminal justice, elementary education, and occupational leadership. Online coursework is delivered in an asynchronous format, which more easily accommodates the schedules of busy working professionals. While AIC requires potential students to hold a high school diploma or equivalent, the school has no minimum GPA or standardized test score requirements, and instead prioritizes recommendation letters that support a candidate's outstanding moral character. AIC offers a singular affordable tuition rate to all students, and financial assistance -- including academic scholarships and transfer-specific grants -- is available. Students can take advantage of tutoring services and opportunities for leadership and professional development through community service projects. As the fifth and final ASU campus in this ranking, the Downtown Phoenix location currently provides education to just under 12,000 students. A perfect size for those students seeking something larger than a traditional private college but smaller than a Big 10 school, the campus provides all the opportunities of a large school while still retaining some of the charms of a smaller institution. Academics are rooted in four different areas: healthcare; law, government, and public service; nonprofit and public social service; and arts and sciences. With 65 undergraduate programs currently available, students can choose from both traditional and modern degrees from one of the best colleges in Arizona, including community sports management; exercise and wellness with a concentration in exercise for obesity prevention; nonprofit leadership and management with a concentration in American Indian studies; or public service and public policy. Many students considering a career in media are also drawn to the well-revered Walter Cronkite School of Journalism and Mass Communication. Embry-Riddle is unique as a university given that its primary focus is on educating students -- be they recent graduates, service members, veterans, or working adults -- in topics related to aviation. As one of the best colleges in Arizona, students know they’ll be instructed by leaders in the field with both the education and real-world experience needed to instruct. All available majors are divided into seven fields of study, including applied science; aviation; business; computers and technology; engineering; safety, security, and intelligence; and space. Students enrolled at the Prescott campus can choose from 24 different undergraduate degrees, but they may be surprised to learn that every degree option is truly unique. While the school does not offer more traditional degrees such as English and education, those looking to work in fields related to aviation will find everything they need. Whether hoping to study aeronautics or air traffic management, unmanned aircraft systems science or wildlife science, Embry-Riddle has you covered. What makes Diné College one of the best colleges in Arizona is not only its commitment to providing rigorous academic programs, but also serving the Diné population by providing an education deeply rooted in their language and culture. To accomplish these goals, the school offers a range of programs and services, including two-year transfer programs, outreach programs, the Center for Diné Teacher Education, and maintained relationships with other colleges and universities in the area. The school is largely dedicated to providing a range of associate degrees to prepare students for further studies, but it does offer three bachelor’s degrees in business administration with a concentration in tribal management and economic development; elementary education; and psychology. Students looking to learn more about their Navajo heritage may elect to complete an AA from the Center for Diné Studies. For students seeking a bit of individualized study, DC offers the Summer Institute, which exists to help students improve their placement test scores for two weeks before freshman year begins. Originally founded in 1960 as a Baptist Bible college, today ACU is an inclusive nonprofit university located in Phoenix that offers a range of undergraduate and graduate degrees. As one of the many Arizona colleges with a Christian heritage, the university places thoughtful emphasis on the spiritual life of each student while also offering a range of degree programs to suit students aspiring to many different professional fields. ACU currently has 20 undergraduate degrees encompassing studies preparing students for both church and business careers. Students interested in ministry can undertake degrees in biblical studies or Christian ministries, while traditional studies in areas of business, education, music, and science are also available. Outside of academics, the school is recognized for a range of sports -- both intramural and school teams -- alongside a wide-spanning selection of student clubs and organizations. A central tenet of all student life programming is to help every person who attends ACU develop their leadership potential through events, programs, ministry, and opportunities for outreach. Established in 1865, Ottawa University offers several flexible academic pathways. Academic programs include undergraduate tracks in communication, nursing, and healthcare management, as well as master's programs in human resources, education, and counseling. Graduate-level degrees are both comprehensive and specialized in nature, as students can select concentrations that best suit their interests and professional goals. For example, education students can specialize in areas such as school psychology, learning technologies, curriculum, and instruction. The vast majority of Ottawa’s degrees can be earned entirely online through asynchronous coursework, or through hybrid learning experiences that combine online classes with classes at the school's Phoenix campus. All students enjoy affordable tuition regardless of where they live and may apply for scholarships and other forms of funding. Students also have access to a vibrant performing arts scene along with student organizations such as the Media Sales Team and the Pre-Health Professionals Club. As one of the oldest Arizona colleges, the University of Arizona has been serving students as a land-grant university since 1885. An institution focused heavily on research, the university receives $606 million in research investments, ranking it 21st among all public universities for funding. But it’s not just research that UA focuses on: every undergraduate student has the opportunity to put their learning into practice via internships, community service, fieldwork, original works, research collaboration, and student leadership opportunities. As an added bonus to those looking for their first jobs, the experience they gain while still in school is noted on their transcripts. In terms of academics, students should have no problem finding a program suited to their needs from the 300 undergraduate and graduate degrees offered. Whether a student is planning to study agribusiness economics or American Indian studies, sustainably built environments, or veterinary science, all these programs and lots more are offered at UA. Two-year colleges play an important role in educational development, either by providing a student with knowledge and credits to eventually obtain a 4-year degree, or by preparing students with immediately applicable vocational trade skills. With over 50 two-year institutions, there are ample opportunities in Arizona to learn a skill or to facilitate an eventual transfer to a four-year school. According to the Arizona Board of Regents, in 2010 there were 21,000 Bachelor's Degrees awarded, 6,000 of which belonged to transfer students from two-year schools. With only 25% of adults in Arizona possessing college degrees, a two-year degree is an excellent method of setting yourself up to get ahead of the pack. We've compiled the best institutions in the following ranked list to help you find the best program for your needs. Operating both the Avondale and Buckeye campuses, Estrella Mountain was formed in 1992 with the goal of joining other Arizona community colleges in meeting the needs of all learners. The school has approximately 15,000 learners and is on pace to fulfill the goals of its master-plan. With a focus on providing a "sense of place" for students from surrounding communities, EMCC is located within one of the most rapidly growing parts of the county. The school, which has been designated as a Hispanic and Minority Serving Institution by the Department of Education, provides over 10 different general and specific associate-level programs. The school offers more common programs in through associate in arts, associate in science, and associate in general studies degrees, and focused programs in elementary education, fine arts (art, dance, or theatre), and business. Competitive athletics are important to EMCC, with student athletes competing as part of the Arizona Community College Athletic Conference. Students with interests outside sports may be drawn to the range of student clubs and organizations. Chandler-Gilbert is currently home to nearly 20,000 students, many of whom are working toward associate degrees. The school is a popular option for students looking to quickly enter the workforce and those planning to transfer to a four-year institution. Chandler-Gilbert works diligently to champion and celebrate the multicultural student population, providing many opportunities to collaborate on culturally-focused projects throughout courses of study. Whether a student is seeking an associate degree or a certificate, the school is home to a wide range of both standard and unique programs. Associate degree options at CGCC include aircraft maintenance technology, computer hardware, desktop support, painting, and retail management. The school prides itself on having a state-of-the-art library, with a range of eResources and physical study materials, including qualified librarians to help students find relevant materials for any project or assignment. The school has men's and women's basketball, golf, and soccer programs. In the early 1970's, members of the Tohono O'odham Tribe came together to create an institution of higher education that could provide training and opportunities to people throughout the region. The prime purpose of TOCC is to serve that population. The institution operates three different campuses to ensure students near and far have access to culturally sensitive and academically rigorous programs of study. The range of associate degrees offered are divided into two categories: transfer programs and direct employment programs in building and construction technologies. Students planning to progress to a four-year institution can select from a range of general and specific degrees, including an Associate of Arts in either Indigenous Borderlands or Tohono O'odham Studies. Students looking to move straight into the workforce can choose from programs in areas of carpentry, construction painting, electrical science, or plumbing. Sports are an important part of being a TOCC student: basketball and cross country teams for both women and men are well-respected in regional tournaments. Operating as one of the ten community colleges in Arizona within the Maricopa County Community College District, Paradise Valley in Phoenix was established in 1985 to provide educations to students in the northeast valley. The school enrolls more than 14,000 students each year in a range of full and part-time associate degree programs. 32 associate level programs are available, with options ranging from general education degrees (e.g. associate in arts, associate in general studies) to specific degrees in accounting, system analysis, and programming. Students seeking shorter programs can undertake a range of academic certificates and certificates of completion offered at PVCC. Sports play a big part in school spirit, with options for both men and women, including baseball, cross country, soccer, softball, tennis, and track and field. Throughout their time at PVCC and even after graduation, students can take advantage of the career services center for career development workshops, internships, employer connections, and a range of career events. SCC is based in Scottsdale, Arizona, and operates as part of the Maricopa County Community College District. This community college is different from other Arizona community colleges though: it's the only public college at this level to be situated on Native American land. An inclusive and diverse student body enjoys a range of career preparation programs, ranging from associate degrees and professional certifications to lifelong learning options and technical education programs. Students looking to complete a two-year program have 34 programs to choose from, including a significant number of unique degrees. Programs includes architectural technology, culinary arts, disc jockey techniques, and tribal development. The Center for Civic & Global Engagement exists to provide students with opportunities to stay active, develop leadership skills, participate in student government, join the outdoor adventure club, and develop new hobbies and interests. The school offers online courses. With a mission to provide small class sizes and personalized teaching from qualified faculty, Cochise College is one of the Arizona community colleges consistently recognized for its approach to higher education. Whether a student is looking to complete a career-focused technical degree to further their career or cut the cost of their education before transferring to a four-year degree, Cochise College is attuned to the needs of each student and endeavors to meet those needs. Cochise offers associate programs that are thoughtful, well-crafted plans of study in innovative fields. Current students are enrolled in programs to prepare them for future roles as aviation professionals, agriculture and equine experts, nurses, economists, and public safety officials. The school provides a modern library, tutoring, labs, a testing center, technology help desk, and student employment services. Cochise has many career focused certificates available in professions like HVAC and web developer. Glendale is committed to providing an expansive array of options for students – whether recent high school graduates, working adults, active military members, or veterans. With more than 100 associate degrees and professional certificates to choose from, students at GCC have many options. Degrees offered through Glendale include automotive technology and sustainability, with many more options. Alumni currently total more than half a million, with thousands being added each year. Current students enjoy a truly impressive array of support services, activities, programs, and resources to help them develop into well-rounded graduates and care for their individual needs. Whether a student needs to find a specific book for a class, visit one of the qualified campus-based counselors, or take advantage of opportunities to develop leadership skills, GCC has them covered. Glendale has a variety of online and hybrid courses that are taught through Canvas. Nestled in the 1.25 million acre Prescott National Forest; many students pick Yavapai College out of the other Arizona community colleges in the area. The 33 associate degrees offered by Yavapai are career-focused programs that instill the skills and knowledge that prospective employers will expect to see upon graduation. Options range from automotive technology and radiologic technology, viticulture/enology, and fire science. Students with a passion for art can take advantage of the YC Art Gallery and Sculpture Garden, while the YC Performing Arts Center exists to bring world-class performers to students. Students interested in pursuing topics in education have the Family Enrichment Center at their fingertips, allowing them to gain practical understanding of child development and learning to prepare them for future classroom roles. Yavapai has many non-credit courses available for students to pursue special interests or learn new hobbies. Based in the town of Thatcher, Eastern Arizona is a public community college that sits within driving distance of Phoenix and Tucson. Eastern Arizona has a long history of providing exceptional academic opportunities. EAC is one of the oldest community colleges in the state, with more than 110 years experience in educating future generations of Arizonans. The college offers more than 30 associate degrees and certificates aimed at providing students the education they need to be successful professionals. Degrees span the academic spectrum, from anthropology to welding, each offering thoughtful courses that contribute to a graduate's preparedness. For those with entrepreneurial aspirations, the Eastern Arizona Small Business Development Center is on hand to provide resources in areas of business plan development, securing financing, accounting, marketing, technology, expansion and growth, human resources, and cash flow analysis. Eastern Arizona offers many web courses for distance learners. With six locations throughout the county, Pima exists to serve the greater Tucson area with two-year degrees and certificate programs. This set of Arizona community colleges works diligently to provide educations that are both affordable and accessible to students; whether they're full-time or part-time. Pima has more than 60 associate degrees and a similar number of certificates (both pre- and post-degree) available. Certificates include culinary arts, digital arts, and digital film and arts. Associate degree programs include translation and interpretation studies, business administration, and fashion consumer sciences. Degrees are divided into 10 different program types and caters to students seeking traditional arts and humanities programs while also meeting the needs of those seeking training in trade professions, business, health, public safety, and more. For the ambitious student, the honors program provides learners with a creative and intellectually stimulating environment where small classes, faculty mentorship, and leadership opportunities are regularly available. Located in the state capital, PC is also one of the oldest colleges in Arizona. Established in 1920, PC was the first school created within the Maricopa County Community College District. PC has one of the largest student bodies, with more than 28,000 students enrolled during the previous year. The more than 150 degrees and certificate programs are taught by a team of 145 full-time and 700 adjunct faculty, each of whom have the required education and experience in their field to ensure quality learning outcomes. Unlike other colleges with a focus on exclusively providing trade profession programs, PC has the bandwidth to offer more traditional degrees in areas of arts and sciences, the humanities, and fine arts for students preparing for a bachelor's degree. Associate degrees available include American Indian studies, Chicana and Chicano studies, medical laboratory science, and therapeutic massage. As the first technical college in the state; the first to offer off-campus courses, and the first to install a computer; GateWay has a long legacy of setting the bar high for other Arizona community colleges. With more than 100 associate degrees and certificates available, students who choose GateWay can pick from more than 14 different interest areas to find a program that meets their need. Offering a balance of technical and liberal arts degrees, students interested in archaeology and plumbing can find a program fitted to their needs. Students can participate in a range of athletics; support their peers through mentoring or advocacy programs; join a student club or organization, and take advantage of the career center. Veteran resources include academic advising, tuition deferments, and an on-campus veteran center. All students have access to the school's library and counseling and childcare services. From its perch between the Colorado Plateau and the White Mountains in northeastern Arizona, Northern Pioneer serves more than 8,000 students each year through a number of associate degrees, certificates, and lifelong learning initiatives. Ranked as one of the best community colleges in Arizona, NPC currently has four different campuses and four centers spread throughout the region to make educational access a reality for students of different needs and backgrounds. Associate degree options are divided into three areas: guaranteed transfer degrees for students planning to earn a bachelor's degree, associate of applied science degrees for students looking to move directly to work, and associate of general studies for students who fall in neither category. NPC currently has six different student clubs for learners to take part in, including student government, student ambassadors, music/theatre/speech, outdoor adventures, Phi Theta Kappa, and the president's scholars program. As one of the best community colleges in Arizona, South Mountain in Phoenix is positioned to be accessible to both urban and rural students seeking higher education. The school prides itself on being a college where students can find purpose and move into meaningful careers. During the previous academic year, 70% of the school's 6,000 students who enrolled were first generation college students, nearly 50% were planning to transfer to a four-year program. The Department of Education has designated the school as a Minority Serving and Hispanic Serving Institution, with more than three-quarters of all students identifying as a minority. Learners can select from 26 different associate programs, with options ranging from general programs – such as an associate in arts or associate in science – to specific studies – such as advanced behavioral health sciences or music business. SMCC sees its purpose as ensuring students have all the tools they need to accomplish those goals. Arizona Western provides students with workforce development, flexible scheduling, affordable tuition, lifelong learning, powerful partnerships, and a path to a four-year degree. With more than 100 degrees and certificates in both academic and career technical programs, Arizona Western is on a mission to be of service to any student that comes in contact with the institution. The degrees at AWC are on the cutting edge of what 21st century employers expect of future hires. Programs like cyber criminology and crop production exist to prepare students to be leaders in modernization and change in the coming years and decades. For the cost conscious student, the college breaks down the cost of credit hours by age, ensuring everyone from recent high school graduates to retirees have the opportunity to obtain educations. Arizona Western offers degrees and certificates online and through their Interactive Television Network. Since 1965, Mesa Community College has been building a name for itself as one of the best community colleges in Arizona. The school operates two campuses to ensure learners around Mesa have access to quality education. With a focus on ensuring students find success no matter what they're pursuing, the school is consistently recognized for quality in academics. The school was awarded the Institutional Progress in Student Learning Outcomes distinction by the Council for Higher Education Accreditation. With more than 80 associate programs comprising current degree options, learners at MCC can access programs that enable them to quickly enter the workforce or provide the foundations they need to be successful in a bachelor's program. Available programs include automation technology, Caterpillar technician training, fashion merchandising and design, and micro circuit mask design. The school offers many degrees and certificates online in programs that are in-demand. 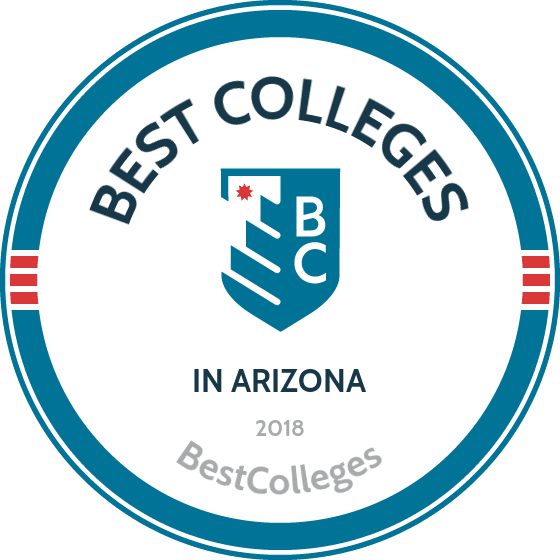 Serving the 18,000 square miles of Coconino County, Coconino Community has ranked amongst the best community colleges in Arizona since opening its doors in 1991. The school created the award winning CCC2NAU program for helping students transition from community college to institutions granting bachelor's degrees, a model that has since been used regionally and nationally. The two Flagstaff campuses currently serve more than 7,500 students, with additional instruction sites in five other areas of the county. 29 associate degrees are currently available, including programs in Colorado Plateau studies, sustainable green building, and fire science. A community college intently focused on serving the local population of veterans, CCC provides a range of services, including tuition waivers and specialized advising to help these students translate their existing military skills into careers. The school maintains a robust events calendar including info about academics, financial aid, events, and student life opportunities. Mohave Community is one of the best two-year community colleges in Arizona with a strong showing in academics, student services, transferability, job preparedness, and veterans services; 13,000 students choose to attend MCC annually. With an instate tuition rate of $81 per hour, MCC also has one of the lowest rates in the state. When enrolling at MCC, new students select either the academic track to prepare them for advanced study, or the career and technical education track to quickly move them into a job. 37 associate degrees can be found between the two tracks, with standout programs in automotive collision repair technology, computer graphics and web design, and an accelerated nursing for paramedics degree. The college has been applauded for its comprehensive community resource guide that connects students with information about finding basic needs, behavioral health services, child and family resources, support in cases of domestic violence or abuse, employment planning, health and medical care, legal assistance, and veterans support. For decades now, Central Arizona has worked to ensure every graduate leaves campus with four takeaways: cultural and civic engagement, integrative knowledge, personal and professional skills, and reasoning skills. No matter which of the 55 available associate degrees a student chooses, they can rest assured knowing that the program is current and follows the four guidelines. The degrees themselves are heavily focused on developing skills that are directly translatable to the workforce while also producing a well-rounded student. Innovative options include geology and planetary science, artist and venue management, drywall/lath, and welding. In addition to a range of campus-based student activities, CAC learners can take advantage of numerous international studies programs in places like Mexico, Ireland, Spain, and China. Central Arizona offers a range of supplemental, hybrid, and 100% online courses. The school offers weekend college programs to fit all schedules. Through this program students can earn an associate's degree in 18 months to two-years by taking classes on Saturdays only. For nearly 40 years, Rio Salado has worked to fulfill its mission of providing transformative learning through active community engagement. The school regularly receives regional and national awards; grants, and commendations for both its academic and residential programs. With more than 50 current degrees and certificates offered – alongside more than 600 online classes – students can choose from a range of topics, including administration of justice, creative writing, entrepreneurial studies, military leadership, and nanotechnology. Rio Salado offers many degrees online with year-round admission. Student support services include advising, and encouragement they need to succeed. Some of these include academic advising, computer labs, counseling and career support, the honors program, test preparation, and the RioLounge. Rio Salado offers the Early College Program, where high school students can begin taking college credits before having graduates. This allow them to earn college level degrees faster and at cheaper cost. If you're thinking about applying to one of the best colleges in Arizona, continuing reading to learn more about living in the the Grand Canyon State. As the 6th largest state, Arizona encompasses a 113,990 square mile swath of cactus-covered land in the southwestern corner of the country. Although commonly known for its hot and arid climate, Arizona is home to a variety of ecosystems from deserts and canyons to forests and snow-capped mountains. Equally diverse is Arizona's populace, as a shared border with Mexico and large Indian reservations have led to a myriad of cultures and communities. The Grand Canyon National Park, a UNESCO World Heritage Site and one of the seven natural wonders of the world, is Arizona's most iconic landmark. With a median household income of $49,774, Arizona is slightly below the national average of $53,046 and their 17.9% poverty rate is 2.9% worse than the rest of the country. Their economy is based heavily on manufacturing and health-care, while the large rural population focuses primarily on farming and ranching. The sheer size of the state combined with stark variety in urban and rural lifestyles means there are attractive options for multiple demographics. A vital step to making the most of your postsecondary education is establishing residency in the state of your chosen school, as resident students receive substantially lower tuition rates than their out of state counterparts. Additionally, residency is an important aspect of creating a beneficial network of connections to ensure success in your post graduation job hunt. One or both of the individual's parents are entitled to claim the individual as a dependent child for tax purposes. The parent is not required to claim the individual as dependent, but must be eligible to do so. Residency is determined by proving continuous presence in Arizona for at least 12 months. Evidence of continued presence can come in the form of vehicle registration, home ownership, employment history or banking records, all of which must have been established 12 months prior to residency application.